But Deep Space Nine seemed to want to explore religion and faith a bit more deeply. True, the requisite aliens were present in the Wormhole next to Bajor, but Roddenberry wasn’t beyond saying that gods could be higher forms of life that we don’t understand. Certainly I agree. My concept of God is that he is a much higher form of life—which would be classified as an “alien”, yes, but still God. But unlike Q, the gods of Bajor, the Prophets, care for the people of Bajor. They are higher life inside the wormhole and emotionally attached to a humanoid species. I can give DS9 a lot of stones for making this faith and religion complex. Bajoran believers are very different. There are those who are fundamentalists, those that embrace new theologies, those that take on whatever religious fervor will bring them to power, those that are seekers, those that are skeptics, and those that believe deeply despite great reasons not to believe. When we write believers, we need to determine how much a believer they are and what kind of believer they are. What do they believe? How has it influenced them? Are they part-time believers? Or are they in all the way, letting their faith guide their judgment? The believers are not all good or bad. Kai Winn, in particular, is shown as a pretty power-hungry believer, and it helps to play fundamentalist when it brings her power, but she actually believes. She devotes herself to the gods of Bajor, in hopes that they will say something to her, do anything with her, and when she is ignored by the gods, she determines her own path—in the end to bring them down and punish them for abandoning her. Kira Nereis, a main character on Deep Space Nine is a believer, but helps run the station with Starfleet, a whole gang of skeptics, but her faith is so much a part of her that it influences her decisions. Not always for the better. When her faith comes in conflict with her life on board DS9, she can sometimes be swayed by faith first; she has made some poor decisions, too, but it’s her character flaws that make her real. When we write believers, they should be complex people. Their faith shouldn’t prescribe a mono-personality of enflamed fundie-ism out to destroy diversity, nor should it be Polly Goodheart who never had a bad thought or deed. It’s the war inside of ourselves, that inner conflict, that fascinates George R.R. Martin—and religion or faith is an influence on that conflict but it doesn’t end that conflict. I still could sympathize with Kai Winn, even to the last episode—she was a believer scorned by the gods, and she acted accordingly. The religion was a complex part of their culture. Bajoran culture and civil society was built with a religion in mind. So was the US, so was Canada, so were Middle Eastern countries, European countries—while they may not show it as much as a fundamentalist nation might, they still were influenced heavily by faith and religion. Look at the coinage, the heraldry, the history. Bajorans felt like their leaders had a divine connection to the Prophets—and that the Prophets were a part of that decision making process. When we write cultures that have a faith (or multiple faiths), thinking about how that culture has affected society is important. How have laws changed? How is power determined or passed from one group to another? How does worship and citizenship intertwine? People could question their faith or religion, could lose faith, but not lose the values associated with that faith, or could improve the faith for everyone. Characters could fall in and out of faith with the Prophets or with their religion, but didn’t always change fundamentally as people. Commander Sisko didn’t change character as he moved from skeptic to believer, as he moved from seeing the Prophets as “wormhole aliens” to seeing them as a guiding, shaping part of his life. Their influence on him may have risen, but his fundamental character remained the same. He wasn’t “brainwashed” and didn’t lose reason just because he gained faith. Simultaneously, Vedic Bureil might instigate some new ideas about faith or worship based on his new understandings of the religion or the Prophets—so the religion or faith was able to grow, or change. People have an impact on faith and religion—sometimes just one person can have that impact. 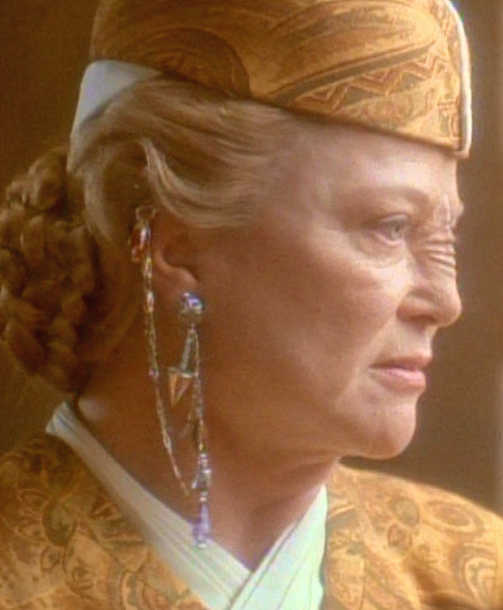 In the episode “Accession” where a voyager is found and revealed as the true “Emissary”, the whole culture changed for a short time. Instead of people following their own paths with guidance from the Prophets, they followed their clans’ or family’s paths before them. The Prophets had to intervene with Commander Sisko to support Sisko’s Emissary status. Frequently, characters questioned the faith or religion of the Bajorans. Case in point, the “Destiny” episode, where a doom prophecy looked as if it were about to be fulfilled and awful things were about to happen, but instead the reading of the prophecy turned out to be in error, and science investigation actually helped do something beneficial. The prophecy came true, but in ways no one expected. The episode causes Kira to question her faith—when her faith comes in conflict with her commander. While Star Trek often asks every culture to question their faith eventually, (and often destroys a planet’s faith or culture in the process) DS9 asks the viewer, and the Bajorans, to question carefully, and with respect. Star Trek DS9 writers respected the religion of the culture. Bajorans were not written as idiots, or unsympathetically. Not all episodes went to the formulaic and stereotypical science vs. religion route (“In the Hands of the Prophets”)—which, this episode, to its credit, does so much better than the evening news which tries to put people into categories of science-hating believers and science-loving atheists. Writers do this by having the sympathetic characters show us how to respect the culture. They don’t just nod, or give lip service to the culture. Many of the main characters have encounters with the Orbs, or with different religious figures; there is respect on the Starfleet side towards Bajorans’ faith and faith leaders. Often, there is respect coming from the Bajorans to Starfleet, though it is more rare. When we write characters whose religions or cultures clash, we can write in such a way that gives away our inner feelings about that religion. We can be sarcastic in our word choices, have other characters disrespect them, make their dialogue one-dimensional, or their characters flat. Or we can make them complex, and show that others with equally interesting faiths can interact with them without prejudice. Your inner feelings about faith and religion will always surface in your work unless you try very hard to make the narrative neutral (or give us a reason that the narrative has such opinions). The Bajoran Way: be true to the culture, be kind to the believers, be honest about the impacts. Following DS9’s way of talking about religious culture means making religious characters complex, sympathetic, interactive, wildly different in their fervor and belief and giving the story a chance to show a neutral or respective way to view religion. Let the reader decide if the religion is interesting. Let the reader decide if the character is good or bad or complex based on what he or she does. Try not to bias the reader about faith in general, but let the faith reveal itself to be positive or negative in each character, or each culture. There were Bajorans who died for their faith to create positive things, and those who sacrificed their lives for the same faith to create what ended up to be negative things. It’s the difference between martyr and suicide bomber—though often both believe they are savior. What Makes a God? Wormhole Aliens and Bajoran Religion on Transpositions.